. . . The blonde wonder with the record thunder . . . In 1999, an Edmonton Jobber of deleted CDs cut a deal with several Sears stores in Edmonton to stock a discount bin right beside the Catalog Pickup area. The intent was to catch the eye of customers waiting either in line or while their packages were located "in the back". Initial stock included the complete Cruisin' series released on CD by Increase Records, after K-TEL had given up trying to sell them. At $6 each, I bought every entry in the series, since the few I had seen previously, before they were discontinued, were selling for nearly $20 each. 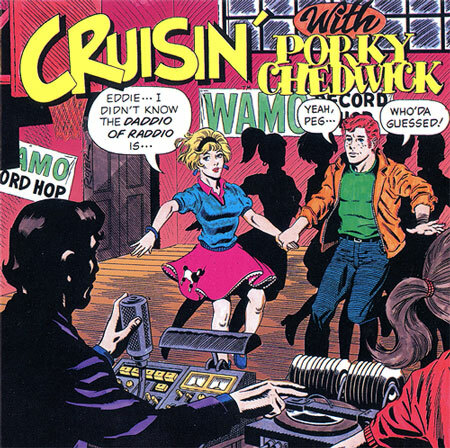 As well as the original entries that I was familiar with, there was Cruisin' 1970, recorded by Kris Stevens in 1995, trying to recreate his WLS days  and this one, simply called "Cruisin' with Porky Chedwick", with no date other than when it was recorded (1993), but clearly trying to recreate how he sounded on WAMO in the late 1950s. The Summer 1958 edition of Vane Jones Log, then known as "Jones North American AM-FM-Radio-TV Station Listings", lists WAMO in Homestead, Pennsylvania, as a 250 watt daytimer, on 860 KHz, a Canada-Mexico Clear Channel, "specializing in Country-Western Music programs", and as the CD liner notes add, "Except for Porky." WAMO began as WHOD in 1948, switching call letters to WAMO in 1956. As of 2014, the current call letters WAOB, are now licensed to Millvale, PA, with 1000 watts day and 830 watts at night. Porky Chedwick pioneered the music that a couple of years later would be called "rock 'n' roll'. He passed away on March 2, 2014, at the age of 96. This recording was NOT a part of the Original Cruisin' Series.